It’s been 36 days since Hurricane Maria made landfall in Puerto Rico. Roughly 75% of island’s 3.4 million residents still lack electricity, along with tens of thousands more in St. Croix, St. Thomas and St. John. We’ve combed through the historical record looking for a power outage of this scale and duration anywhere in the US and can find none. Based on available data, we believe Hurricane Maria has caused the largest blackout in American history. On September 20, Puerto Rico was battered by winds averaging 123 mph over the course of 12 hours. Comparing that to his database of 13,00o cyclone events around the world, our Impact Lab partner Sol Hsiang finds only 5 more intense storm strikes since 1950, all which occurred in the Pacific. In more than 60 years of data, Hurricane Maria is the strongest cyclone event in the Atlantic Basin. The day before the storm there were already 61,000 customers (defined as a household or business, not an individual) without power in Puerto Rico – lingering effects from Hurricane Irma which hit the island two weeks prior – and another 6,000 without power in the US Virgin Islands. The day after Maria hit, 1.6 million customers in PR and another 46,000 in USVI were without power as both US territories went completely dark. This week 1.2 million households still lack electricity in PR (75% of the total), 22,000 households in St. Croix (98% of the total), 16,000 in St. Thomas (71% of the total) and 3,000 in St. John (100% of the total), based on data submitted by each territory’s utility to the Department of Energy’s Office of Electricity Delivery and Energy Reliability. Adding up these daily OE-417 form submissions since September 20, we find that Maria has so far disrupted 1.25 billion hours of electricity supply for American citizens. To put that number in context, Hurricane Katrina disrupted 681 million customer-hours in 2005. Hurricane Rita, which came on Katrina’s heels, disrupted another 203 million. We’ve dug through all 20th and 21st century hurricanes and other major blackouts, including Hurricanes Camille and Andrew, the 2000/2001 California electricity crisis, the big Northeast blackout in 2003 (and 1965) and the 2014 polar vortex. We can find no event in recorded US history where there were as many people without power for as long as has occurred over the past month in Puerto Rico and the US Virgin Islands. Hurricane Irma came close this year, and in our estimation is the 4th largest blackout on record. A peak of 6 million Florida customers lost power, along with 1 million in Georgia and 180,000 in South Carolina. But service was restored relatively quickly in those areas, capping lost customer-hours at 753 million, just shy of Hurricane Sandy’s 775 million in 2012 (Figure 1). More customers were impacted by the 2003 blackout in the Northeast US, but for a much shorter period of time, resulting in an estimated 592 million customer-hours of lost electricity service. Hurricanes Ike, Wilma and Irene also make the top 10. For Hurricanes Georges and Hugo (which also hit PR and USVI), we made rough approximations based on available news reporting. Pre-1960s events were more difficult to accurately assess. However, the only one we believe might belong on this list is the 1938 hurricane that hit New England. We are pretty confident that it would not rival Hurricane Maria for the top slot. Puerto Rico’s governor Ricardo Rosselló has set a goal of restoring power to half of all customers by November 15 and 95% by December 15. If PREPA (Puerto Rico’s utility), FEMA, the Army Corp, and the Puerto Rican government can meet this aggressive timeline, and a similar restoration pathway is achieved in the US Virgin Islands, Maria will have resulted in more than 2 billion lost customer hours in total. That’s three times the impact of Hurricane Sandy or the 2003 Northeast Blackout. It’s more than all US outages between January 1, 2013 and August 31, 2017 combined. Last week the US Army Corp commander in Puerto Rico offered a more pessimistic timeline, estimating a majority of the island won’t have power until January or February of next year. Accelerating that timeline is not only a humanitarian necessity, but is the single most effective step the US government can take to improve electricity reliability if measured simply as providing the most consistent electricity supply to the most Americans. It’s certainly more impactful than the Department of Energy’s proposed FERC rule to prevent “fuel supply emergencies”. Every day Puerto Rico and the US Virgin Islands continue at current service levels results in more lost hours of electricity supply for American citizens than 54,000 years worth of lost customer-hours due to the “fuel supply emergencies” DOE’s proposed rule is intended to address (based on 2012-2016 averages). 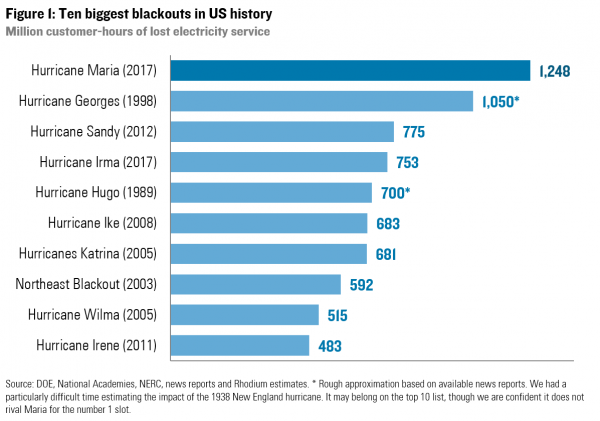 The fact that three of the top ten biggest blackouts in US history have all been hurricane-driven outages in Puerto Rico (Maria, Georges and Hugo) also underscores the need to rebuild the island’s grid (and the rest of the country’s grid for that matter) to be more resilient to storms in the future. Warmer sea surface temperatures due to climate change increase potential hurricane intensity, which most cyclogenesis models predict this will result in more Cat 4 and Cat 5 storms in the Atlantic Basin in the years ahead. Hurricanes are already the leading cause of power outages in the US by a wide margin. That will likely grow as the climate changes.